RVMedia 2.1 has been released. This is a free update for customers who ordered RVMedia before. However, the list of models available for detection is greatly expanded. We optimized a camera searching, however, there are much more URLs to check now, so a search becomes slower. To speed it up, we added a new parameter to SearchCamera method, allowing to narrow down search, if you know your camera model(s). Also, you can increase the count of camera search threads. 4) MP4 (or QuickTime) file containing H.264 (i.e. MPEG-4 Part 10) video stream. Only the (1) was supported before. Note: the main reason for using GStreamer is supporting H.264 video streams from cameras and using RTSP protocol. Playing video files is a by-product. RVMedia can play/send local video files without GStreamer (RVCamera.DeviceType=rvdtFile). If RVCamera.DeviceType=rvdtDesktop, the component supports multiple monitors. You can choose to send the whole desktop or the specified monitor (in addition to the modes of specifying a desktop rectangle or specific window). In the mode DeviceType=rvdtWebCamera, in addition to VideoDeviceList property, we added a new property VideoDeviceIdList, listing unique names of web cameras. This property is useful, for example, if you want to store the last used web camera. Names in VideoDeviceList are not necessary unique, indexes of devices may be changed when the computer is rebooted, so a value from VideoDeviceIdList can be used. - H.264 stream was not played via HTTP. Last edited by Sergey Tkachenko on Fri Nov 28, 2014 2:31 pm, edited 2 times in total. 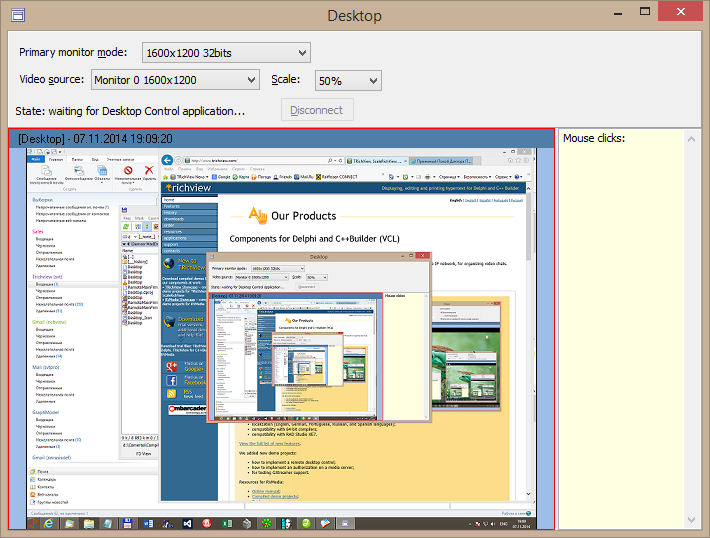 This demo is updated to add multi-monitor support. You can see a combobox allowing to choose a monitor. Also, you can choose how to shrink frames of desktop videos (to reduce traffic and CPU usage). This demo is changed to add support of new supported video formats.